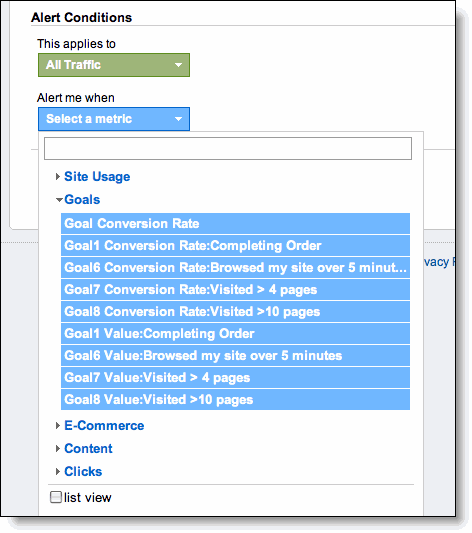 Google Analytics Solutions: Launch: Intelligence Just Got Smarter! Launch: Intelligence Just Got Smarter! dedicated assistant, monitoring your website traffic for significant changes that you should know of. Wondering what’s going on under the hood of your site traffic? Intelligence will tell you. And it’s improving and getting smarter. Here are two improvements we’re announcing today. If you have linked your Google Analytics account with an AdWords account, Intelligence will now automatically surface important changes in your AdWords campaigns performance right in Google Analytics. So, in addition to the alerts you are used to getting, such as time on site and revenue, you’ll now receive alerts about your AdWords campaigns and the traffic they are bringing to your website. You might already be familiar with custom alerts in Google AdWords, which alert you when important changes you specify happen in your account. With AdWords alerts in Analytics Intelligence, you benefit from automatic detection of significant changes, with no extra work for you to configure these yourself. 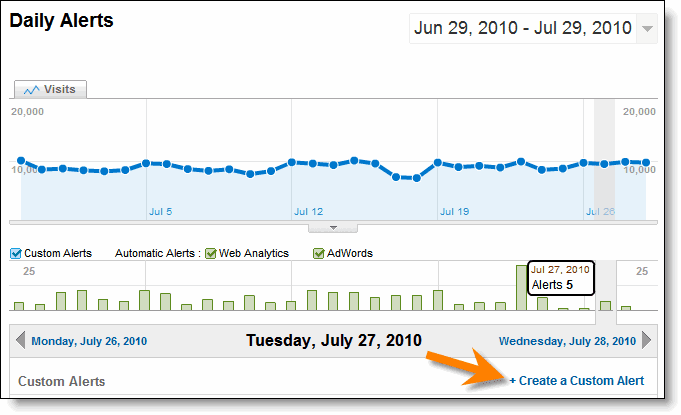 For example, you might see an alert if the CTR for one of your campaigns increased unexpectedly. 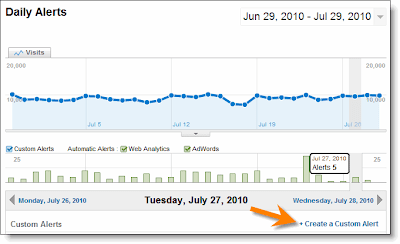 Or you might find that revenue from one of your destination URLs has dropped significantly from the week before. In both cases, you didn’t need to know ahead of time what to look for. These important changes are automatically detected and brought to your attention. Here's how to use them. 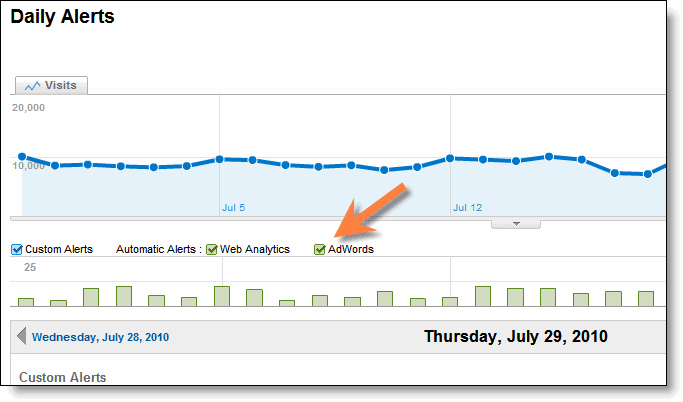 AdWords alerts in Analytics Intelligence work just like automatic alerts have in the past. You can learn more about how to use Analytics Intelligence here: http://www.google.com/analytics/analytics-intelligence.html. In order to use AdWords alerts in Analytics Intelligence, you need to have a linked AdWords account. Additionally, you need to have destination URL auto-tagging turned on. 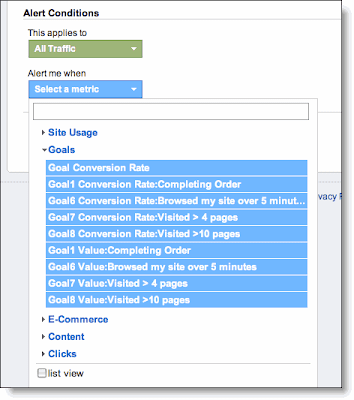 If you already use the AdWords reports in Analytics, you’re all set. 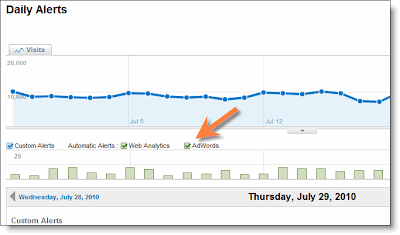 Directly underneath the graph, you’ll see check boxes for Custom Alerts, Web Analytics, and AdWords, which is next to the orange arrow in image above. If you want to focus solely on your AdWords alerts, you can uncheck Custom Alerts and Web Analytics. Then, you can adjust the sensitivity slider to see just the most significant alerts or create an advanced segment to more closely investigate the change. You name the alert, apply it to a profile, designate a time period, and then set conditions for the visitor (such as City matches New York, or Campaign matches Fall Sale), and the metric (such as time on site greater than 5 minutes, or % of new visits is greater than 30%). And now, we’ve added a ton more options in the Alert Conditions drop downs, including all of the 20 goals you have configured in each profile. They’ve also been dressed up for a night on the town, wearing their actual goal names such as “Goal8 Value: Visited >10 pages.” Only goals that you have configured will show up in the list, keeping the drop-down menu clean and courteous. Among the other conditions and metrics now available: e-commerce and AdWords metrics, as well as more traffic sources, and more content page metrics. And remember, you can tell Intelligence to email you when an alert is triggered. Intelligence is getting smarter and smarter, making you more effective. Try it out if you haven’t already. Hopefully, by now, you’re making good use of the Intelligence report in Google Analytics. If you’re looking to avoid the feeling that Google Analytics is “puking” too much data at you - a phrase coined by Google’s beloved analytics evangelist Avinash Kaushik - you're not alone. We've heard you, and Intelligence is your first stop. As we mentioned in a previous post introducing Intelligence, it’s your dedicated assistant, monitoring your website traffic for significant changes that you should know of. Wondering what’s going on under the hood of your site traffic? Intelligence will tell you.